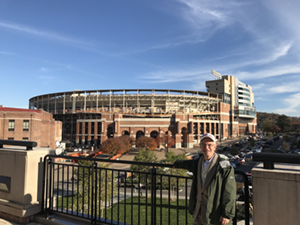 A new endowment will provide support for a wide variety of opportunities for the Fern and Manfred Steinfeld Program in Judaic Studies at the University of Tennessee, Knoxville. Bob Andrews (’72) established the Robert N. Andrews, Solomon and Rachel Derby, Rabbi Josiah Derby, Rebbitzen Adele Derby, and Rabbi Matthew Derby Judaic Studies Excellence Endowment in honor of members of his family. Andrews transferred to UT as a senior and graduated with a degree in business. It was his first time away from home, but the friendships he established while in school helped him feel at home. His cousin, Matthew Derby, was the Hillel rabbi and spiritual advisor to Jewish students on the UT campus, as well as the rabbi at Temple Beth El in Knoxville. Andrews’s maternal grandparents were originally from the Ukraine. His grandfather was the first of the family to leave. His grandmother, mother, uncle, and cousin were forced to leave the Ukraine and were smuggled out in a hay wagon. They were stopped at the Russian-Polish border. Due to their background, Andrews’s grandparents made sure their three children had a Jewish education. Andrews attended Heska Emunah, a conservative synagogue, led by Rabbi Noah Golinkin, a colleague and friend of his uncle, Rabbi Josiah Derby. Andrews sees that his generation, however, seemed to have lost the drive to continue that education after their Bat Mitzvah. Andrews’s gift will help transform the program in a number of ways, including operating funds to allow Director Helene Sinnreich to spend in new and exciting areas. At present, funding for the program is earmarked for specific purposes, such as student scholarships, faculty research, lectures, or specific-focus topics. Andrews’s knows his family, wherever they are, have big smiles on their faces due to his endowment.